You've seen the gorgeous Mathilde Blouse sewing pattern released by Tilly and the Buttons yesterday, right? Well, don't be too jealous, but I was one of the lucky pattern testers!!! I was so shocked when Tilly asked me, but I was determined to nail this sweet little number and I'm really pleased with the result. 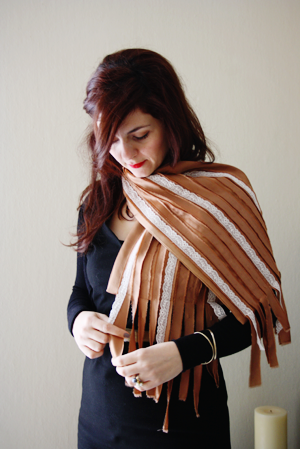 The pattern itself was lovely to work with and came together fairly quickly and easily - thanks to the most comprehensive instructions I have ever had the pleasure of following. Tilly has outdone herself regarding the quality and the detail of her instructions which actually felt more like a sewalong - in fact I think she's planning on using them as a bit of a sewalong here. Unusually for me, I didn't have to make any adjustments to get a great fit! I just cut a size 3 for the main bodice and a size 2 for the shoulders, neckline, armholes and sleeves. Mathilde has a number of dreamy details that are hard to resist - back buttons, front yoke, frothy sleeves and tasty tucks. On the tasty tuck front, there are two rows of three tucks on the front bodice and I would seriously recommend practising on a muslin first if they're a first for you. Don't worry, they're not hard, just a bit fiddly...especially when using slippery fabric. Tilly offers some great advice for handling the tucks with slippery fabric, but I would also add that I pressed, pinned and sewed each tuck individually. This took a bit of time, but worked out really well. I squeezed the blouse out of some fine, 1960s cotton voile that I bought in Cyprus. It's really sheer and I didn't want to ruin the look of the blouse by wearing a cami/vest underneath, so I underlined the bodice with cotton lawn. Although this compromised a bit of the voile's drape, the result is still lovely...so I think I got away with it. I left the sleeves unlined and I'm fond of how delicate they look. Just proving that my tucks do really exist! Normally, white's really not my 'thing', but I'm pleasantly surprised by how this turned out. I've already worn it a couple of times and it's received plenty of compliments, which is always nice. 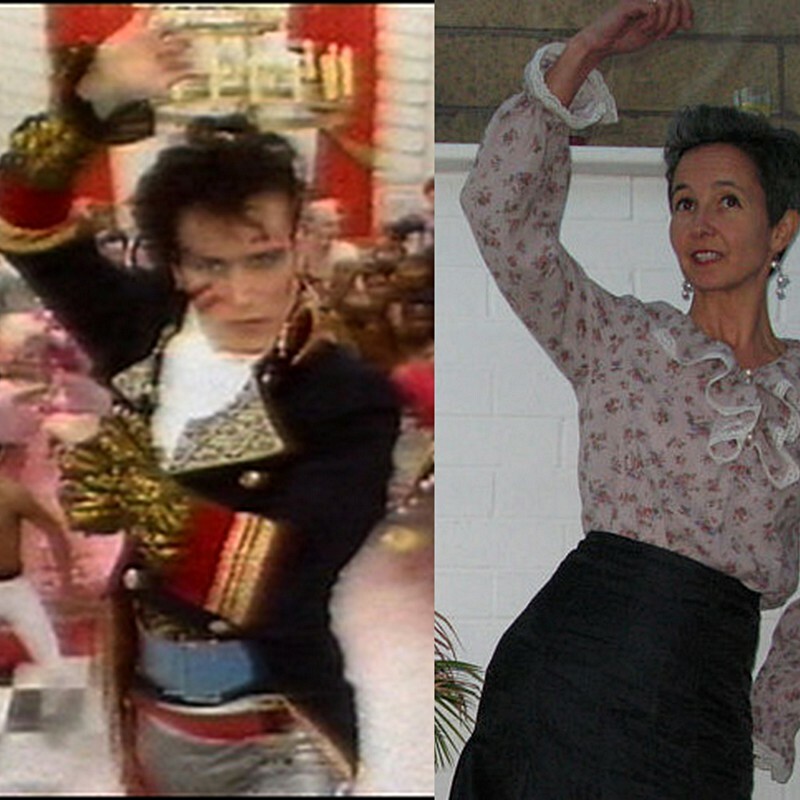 For me, this pattern's a winner and I'd like to make another version with shorter sleeves too. Thank you Tilly for inviting me to be a part of your exciting process! 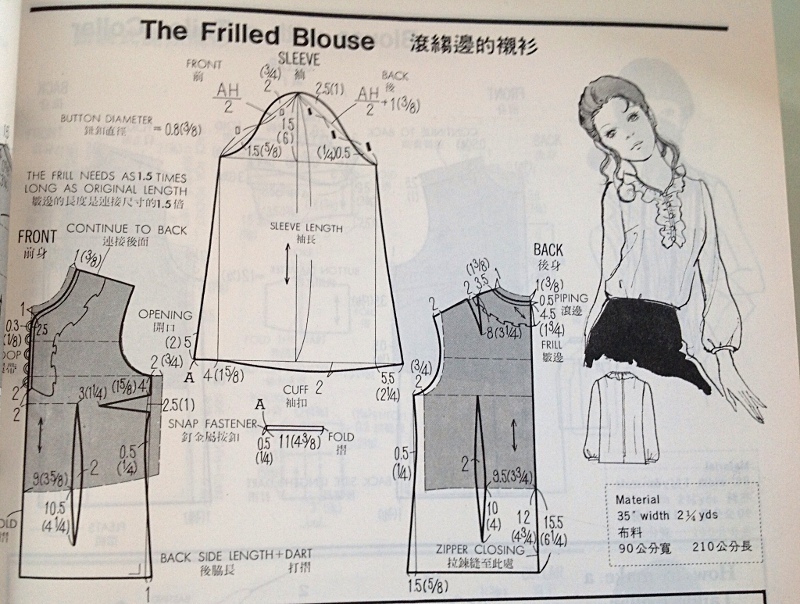 What do you think to the Mathilde Blouse sewing pattern? Hello, everyone! I'm very happy to be a guest of the lovely Marie today! 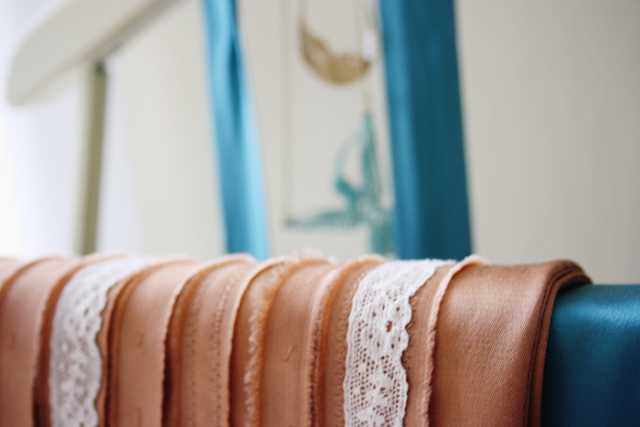 When she contacted me asking if I wanted some vintage lace to make anything I wanted, I was so excited! I'm all about girly and feminine clothes, so lace fits perfectly in my aesthetics. I'm so used to being inspired either by a pattern or fabric, however, I had a hard time figuring out what I wanted to make using this lace as a starting point. It was a change in my creative process and I actually enjoyed the challenge. 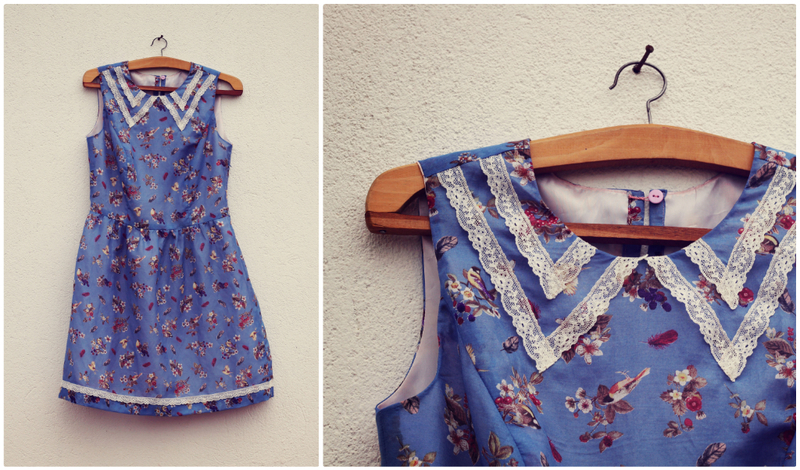 My first idea was actually a dress with a bodice VERY similar to Winnie's gorgeous Librarian blouse. 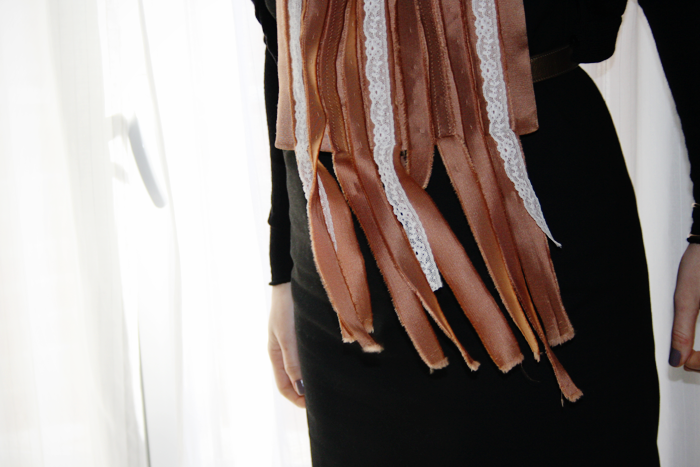 For the sake of variety in this blog series, luckily I changed my mind and started thinking about a lace collar. 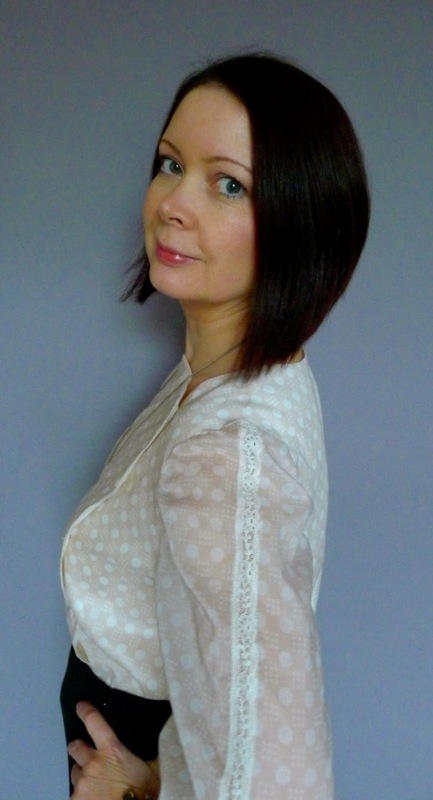 If you are a reader of my blog, you might know I am slightly obsessed with collars. But since a lace collar might be too twee even for me, I decided to go with a half fake collar, made with two lines of lace. When the idea was clear in my head, I went looking for patterns and I used the bodice of the Burdastyle Sewing Handbook Dress, which I altered by eliminating the front keyhole and making a small one at the back, doing an FBA and adding 1.5cm to the length. 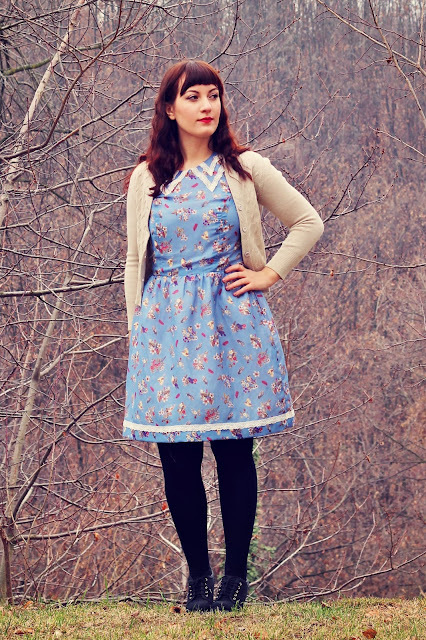 And since I wanted a gathered skirt, I went with one from my most trusted patterns, Deer and Doe's Sureau dress. Finally, I totally lucked out with fabric, when I found this silk blend with a bird and floral print on sale. It was just perfect in terms of colour, print and weight. The dress came together very quickly and as a final touch, I added some lace to the bottom of the skirt. I'm extremely happy with the final result, it's something I see myself wearing a lot as soon as the temperatures will go up a bit. About that...I apologise if I look a bit rigid in these photos, but it was just about to snow (we now have almost a meter of it) and I was freezing! I don't know about you, but I'm head over heels with Anna's dress - I think it would slot into my wardrobe just perfectly *hint*! 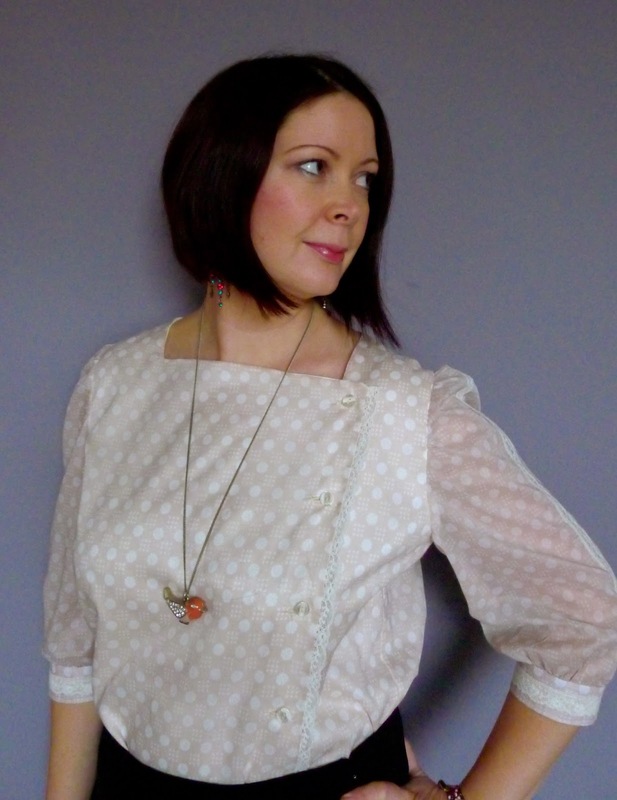 Next Sunday, I'm excited to be featuring another much loved sewing blogger - Handmade Jane! To see who's already taken part and who else is coming up, hop on over here. Karen has all the best ideas! Unless you've been hibernating, which would be totally understandable considering the current icy weather, you'll know about her latest clever idea to help us all achieve our sewing resolutions this year. The 2013 Sewlutions Jar - image cheekily borrowed from Karen's blog! "I'll be happy if I make one dress this year that is gorgeous and that fits like a glove. I want it to be 'frosting', but frosting that I'll wear more than once." Why am I telling you this? Because when Karen picks a random sewlution to check up on during the year, I so don't want to be the face of shame! I want to nail my sewlution earlier rather than later, so I don't end up rushing it. I flagged up this pairing back in September 2012 and I still can't get it out of my head. 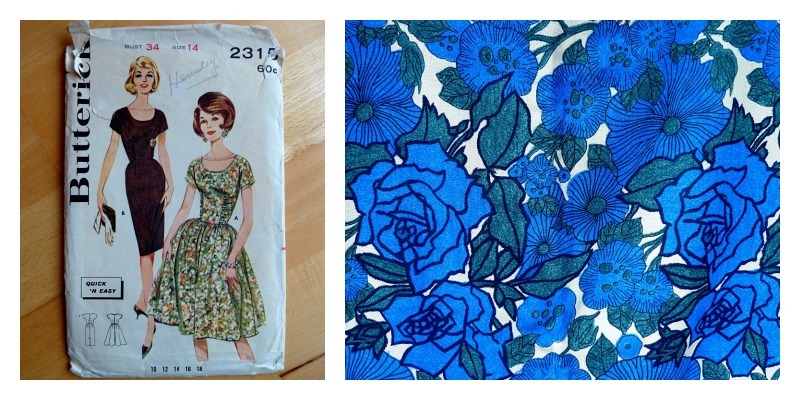 I think it fits my criteria perfectly - Butterick 2315 is beautiful, yet wearable and the 1950s wool crepe will give it that frosting quality that I'm after. 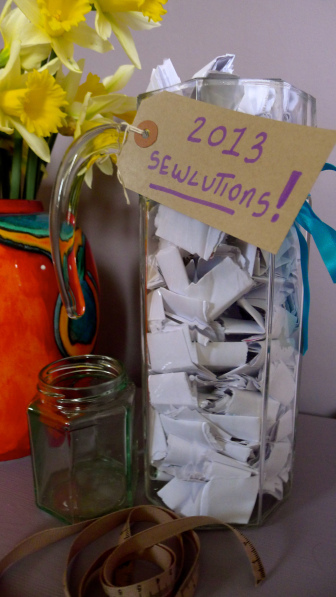 Have you thrown something into the 2013 Sewlutions Jar and how do you fancy your chances of success? As an aside, you must read Karen's breakdown of the jar's contents - it's really fascinating! Meet my new Brother Innovis 10A gifted to me by Alan Bamber of Bamber Sewing Machines. I say 'new', but I've actually been test-driving this baby for months now, after Alan came across my blog, liked what he saw and asked if I'd like to review this machine. But, I figured it might be more helpful for beginners (or experienced stitchers wishing to switch machines) if I did a series of posts about what you might look for when choosing your first or a new sewing machine. What I want to know is - would you find these posts useful and if so, are there any burning questions you'd like me to try and answer? If I can help anyone to make an educated decision about what sewing machine is going to suit their needs best, I'd like to try! For now, I have an interview with the man himself. After chatting a fair bit to Alan, I became intrigued by the family business from its humble post-war beginnings to its successful development over the years. I hope you find it an interesting read! 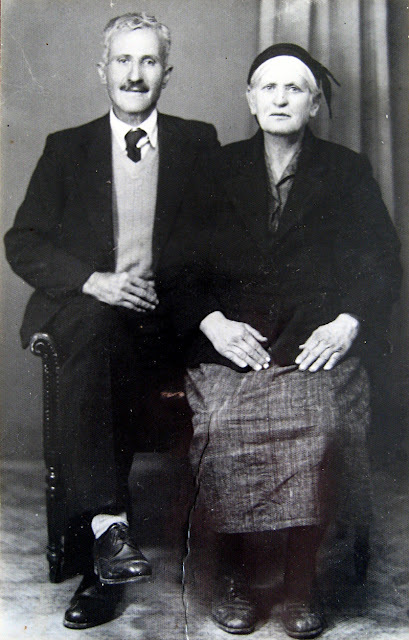 Bamber Sewing Machines is a family-run business spanning almost 67 years - tell me about its rich history. My Dad Roy started the whole thing off back in 1946 when, as a boy in post war Salford, he scrambled up a bomb site and rescued a sewing machine. He wheeled it home on a hand cart, cleaned it up, got it working and sold it. From that one machine he built up our business through hard work and determination. Dad is 81 now and while he may not run the day to day business any more, my brother Steve and I take care of that, there could be no better man to turn to for advice or guidance. We're agents for the top brands of domestic sewing machines - Bernina, Janome and Brother. Steve takes care of the retail side of the business. The general public can visit our Manchester store where we have around 70 sewing machines, overlockers and embroidery machines on display. They're all set up and ready to go so people can sit down and try any machine. Also on the ground floor, we have a large workshop where we carry out all our repairs. We receive around 35 - 50 sewing machine repairs each week from everyday sewing enthusiasts as well as from schools and colleges. So, we have a very busy workshop. Steve, myself and Shahid all work in the workshop repairing and servicing all these machines. You also offer workshops to the general public. How does that fit in to the business? Caring about our customers means offering an all round service beyond just the sale of any sewing machine. So on our first floor – alongside our haberdashery, range of fabrics and sewing machine accessories – we have a classroom which is another busy place. We hire out this classroom and Lorna Knight and Celia Banks are just two of the well known sewing teachers that have made good use of it, passing on their wisdom to many, many people. Two of our own girls (they like being called girls! ), Maggie and Kathryn, also run an overlocker course and our quilt club. I would encourage anyone who has a sewing machine to sign up to a sewing workshop in their area. Not only will you make new friends, you will enjoy using your sewing so much more if you learn some new techniques that help develop your ideas. Just like the business itself, your own role is pretty varied. Tell me a bit about it. My side of the business is dealing with the education sector and developing our online presence. 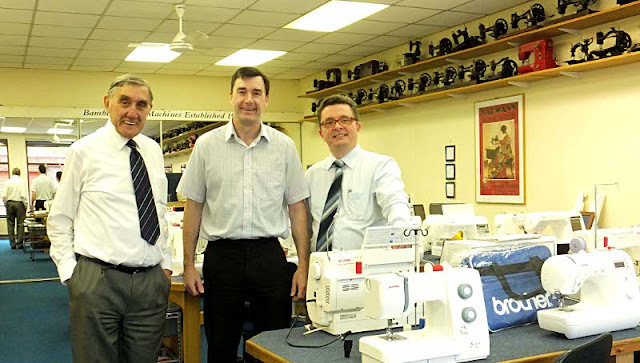 I arrange the service of sewing machines for schools and colleges in the Northwest region. That's about 300 or so schools, colleges and universities. I know hundreds of teachers and quite a few of them I've known for 30 years. They usually book their classroom sewing machines in for service at least 12 months in advance, which is a good indication of the level of service we offer. I also organise the supply of new sewing machines, spares, accessories and haberdashery supplies to schools throughout the UK. I produce a small education supplies catalogue and post it to around 6,000 schools and colleges. This brings in orders from around the country and keeps me out of mischief. 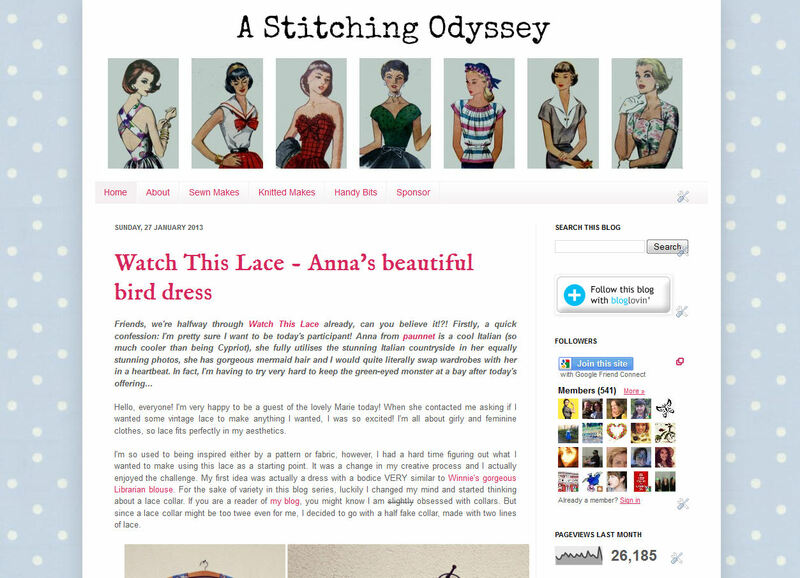 Finally, I maintain our websites and blogs and I keep an eye out for interesting people developing their own blogs concerning all things sewing. I like to help and encourage as many of these people as I can, because it's not only good fun, it's the future! 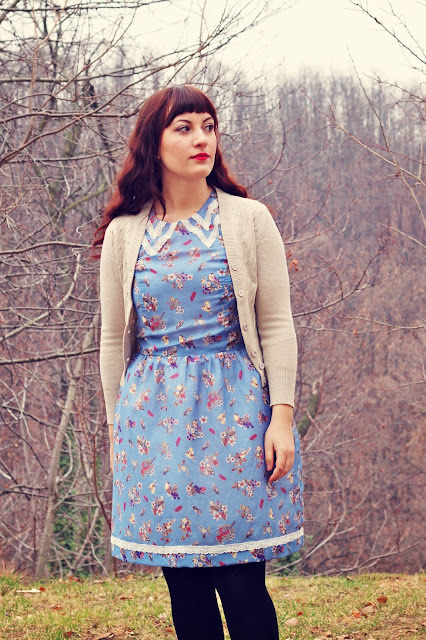 You seem to have your finger on the pulse regarding the online sewing community. Why is connecting with bloggers so important to you? I understand that anyone that sews and then blogs about their adventures is enormously important. 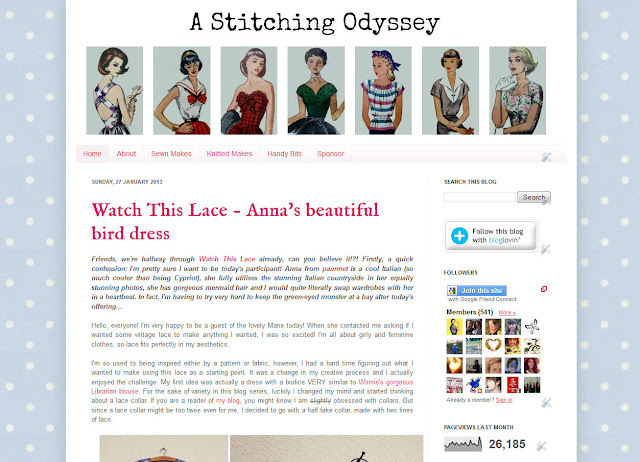 Their posts reach thousands of people and encourage other sewing enthusiasts. 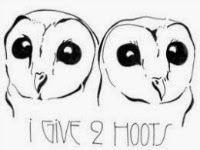 I found your blog and liked the way you offered sound, practical advice. I would also throw this question back to you in a way and ask you - do you realise that you are not just blogging, you are teaching? I wanted to offer you the Brother Innovis 10A to help people make a decision about what to buy. Too often I see people bring in a machine for repair that is such poor quality it isn't worth repairing and it's so sad to tell them they've spent all their money on a rubbish machine. This machine is relatively low cost, but it's very good quality, will sew a wide range of fabrics and will last. In other words, it's good value for money. My hope is that you will demonstrate, over the coming months and years, that here is a sewing machine that people can trust and have faith in as you use this machine with your many sewing projects. I would also add that anyone who is considering buying a sewing machine should find a local dealer and call in for a demonstration before spending their money. A lot of my readers will be interested to hear that you’re launching a vintage site soon. Is there anything you can share about it...or is it strictly top secret? 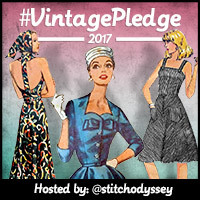 Keeping an eye on blogs helps me identify current trends and, well, I'm sure most of your readers will know that vintage is huge! I enjoy using the internet so the idea of creating a space about vintage patterns, sewing machines and people was right up my street. 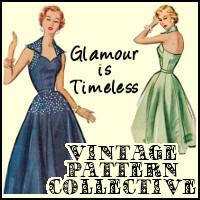 It will be called Vintage Persuasion and I hope to make it as interesting as I can, even adding listings of vintage events around the country. 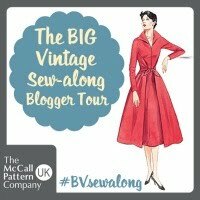 Not only will I be showcasing all the current collections of vintage patterns we stock - from Vogue, Butterick, McCall’s and more - I have also approached a few sewing bloggers to demonstrate their experiences as they make up some of these patterns. Roy, Steve and Alan Bamber - check out the two shelves of beautiful old sewing machines! I hope you’ve enjoyed taking this virtual tour of Bamber Sewing Machines! Please remember to let me know if you'd like me to cover anything specific in my upcoming posts on what to look for when buying a sewing machine. And of course, if you already have a Brother Innovis 10A, I'd love to hear what you think of it! I took a pattern drafting course at a local education college last year-ish and despite a promising start, it ended up being a huge disappointment. With my hunger for knowledge left unsatisfied, I decided to sign up to four 'intensive' lessons at the School of Sewing, the first of which I attended last Saturday. It was six hours long, we worked really hard and I now have high hopes for the next three lessons. Working with Winifred Aldrich's Metric pattern cutting for women's wear - which is available for just £9.99 at The Works by the way - we plotted our skirt blocks, sewed them up in muslin, made any necessary adjustments, copied them onto cardboard for longevity and then repeated for the facing. We also spent a good portion of the afternoon practising drafting different skirt designs, using quarter scale versions of our block. This involved a lot of tracing, cutting out and glueing...just like being back at school! The sessions are spread across four months to give us the opportunity to practice what we learn. So our homework is to draft and make a skirt to wear to the next lesson. In theory this sounds brilliant, but my big problem is that I don't really get on well with skirts. I hardly ever wear them and with the exception of my Tilly picnic skirt, I can honestly say I've not made a single one that I'm truly happy with. Although I have a relatively small waist, I also have muffin tops. Why is this a problem? The muffin tops make it impossible to wear skirts on my high hip, because they simply ride up to my smaller waist and gape. 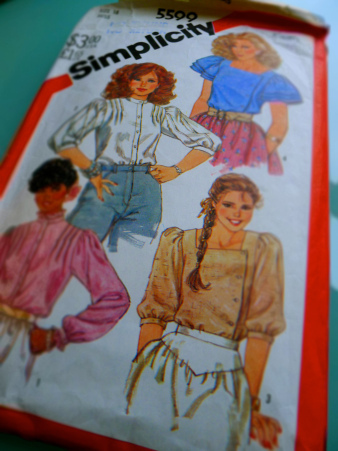 So I have to make high-waisted skirts, which would be fine if I didn't have a short-ish waist and a big bust. I genuinely don't know how to get around this issue, so I just stay clear of skirts, but I'm quite happy living in dresses and jeans. ...I think I'd feel more comfortable in these more casual styles. 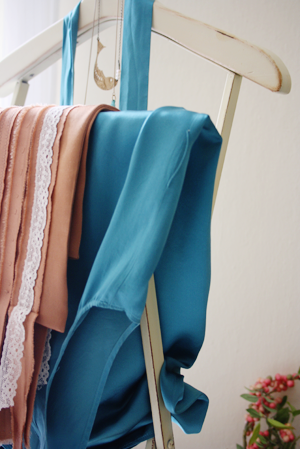 But nothing's set in stone, I'm still pondering and hoping that I'll actually end up with a skirt that I love wearing! What about you, are you a skirt person? Are there any designs or patterns that you'd recommend? Happy New Year friends! I'm very excited to finally be sharing a 'project' with you that was set in motion last summer when I came across a rather large bundle of beautiful vintage lace. After much consideration, I just couldn't get A Common Thread Project out of my mind, the inspired idea from Mena of The Sew Weekly fame (see all the pretty projects). 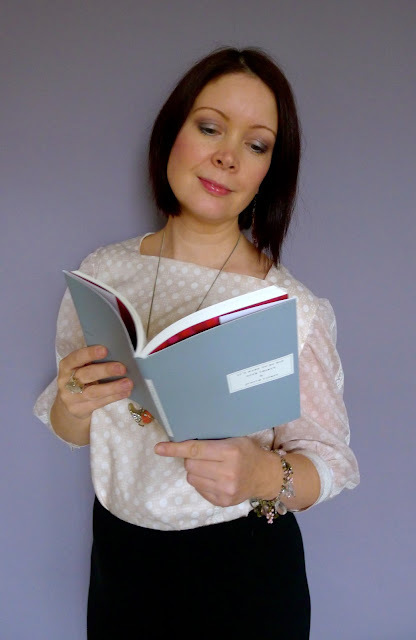 The tantalising thought of sharing my loot with sewing bloggers internationally and showcasing our different creations was too good to pass up. So I got in touch with eight of many, many beloved bloggers to see if they'd be up for brightening our last two winter months. And guess what...they all agreed! Yipeee! 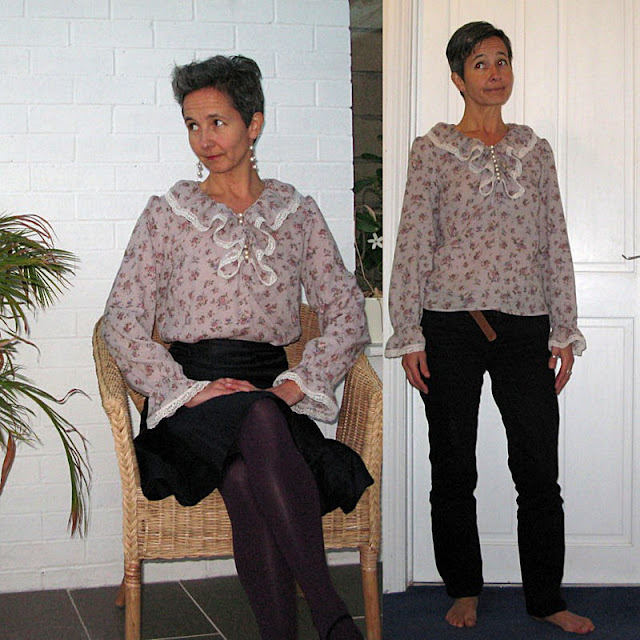 To kick-start Watch This Lace, I present to you my most cherished make to date - The Armistice Blouse from Folkwear patterns. A Common Thread boffins will note that Casey made this as her project too, but I just couldn't help myself – love that gal and the blouse! Why is this my most cherished make to date? Aside from the beautiful pattern details, I made it using silk that my great grandmother spun/wove with her own two hands in the 1940s. I know nothing about the technicalities of weaving silk fabric - but I do know that she even nurtured the silk worms herself. This is a woman - pictured below with my great grandfather - who raised five children whilst relentlessly working in the fields all day. How she found time to also weave enough silk to leave as a dowry for each of her four daughters is a mystery to me, but then I guess she didn't have a TV to distract her! 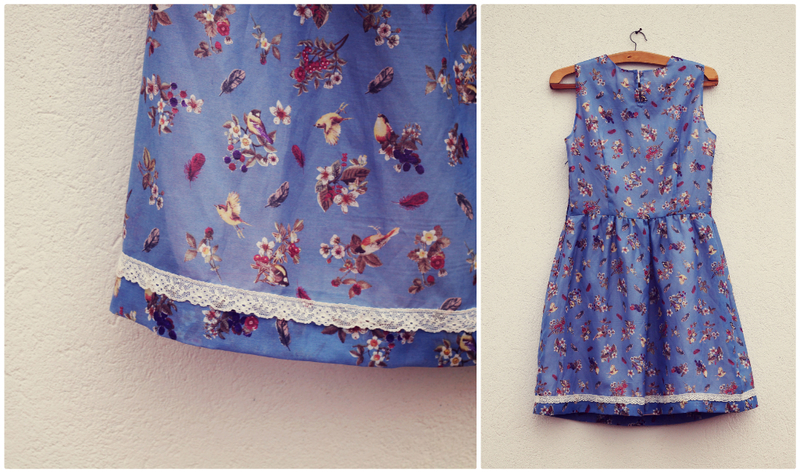 Onto the beautiful pattern details! 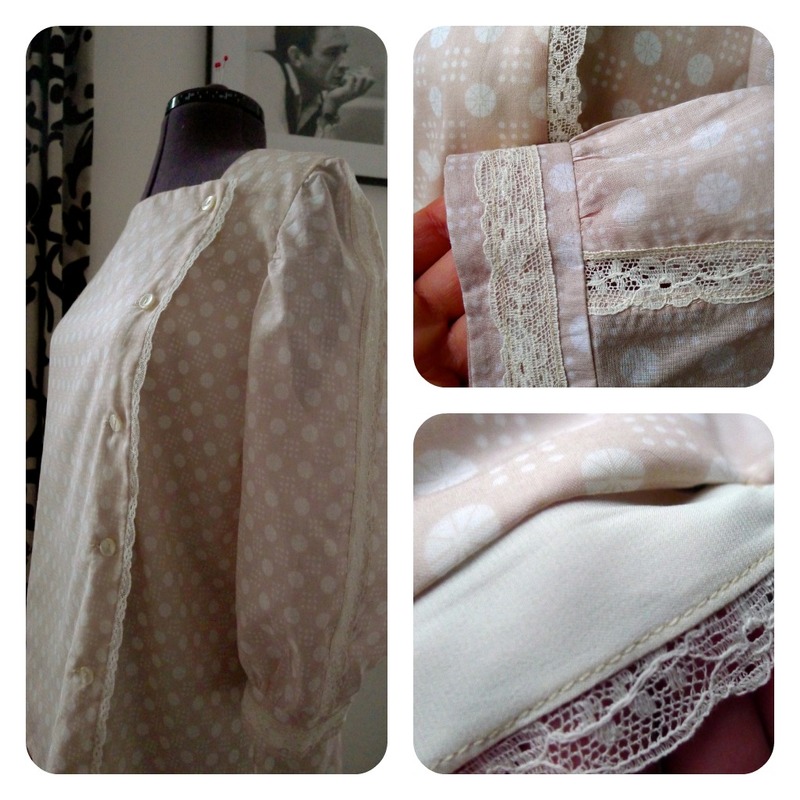 This blouse dates from 1918 and has such a deliciously romantic and floaty feel to it. 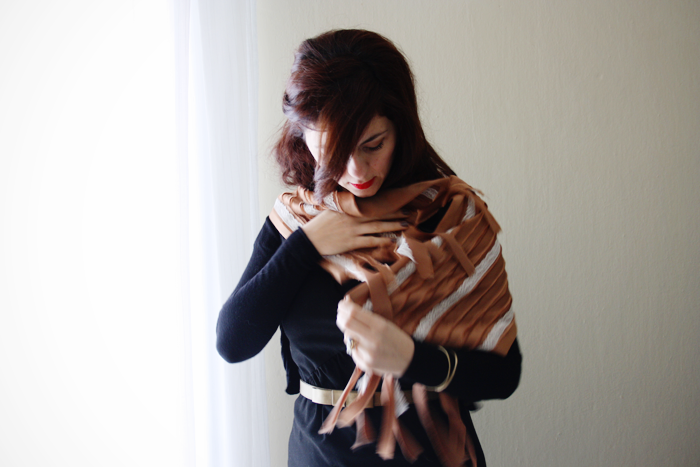 The reason it's so flattering to wear is the gathered back, which counteracts some of the fullness of the design. 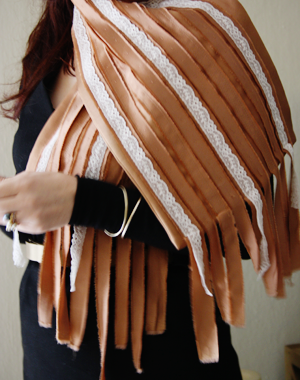 This is cleverly constructed by actually gathering the back and then sewing the self-made tie over the gathers. 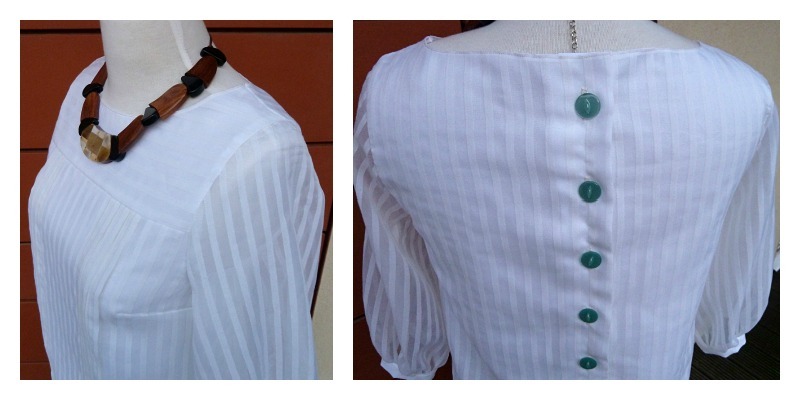 Of course the over-sized collar and front panel are the real stars of this blouse and lend themselves to so much modification. 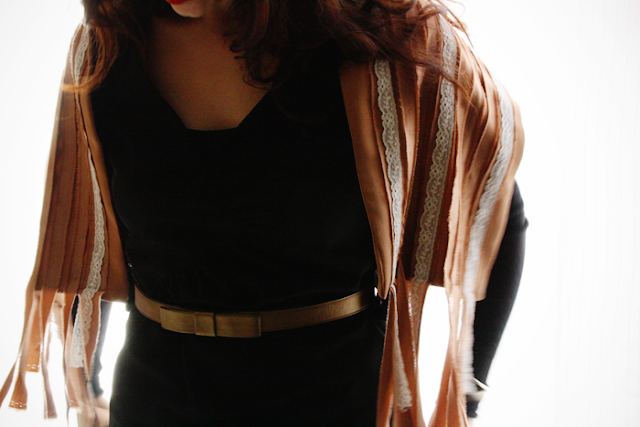 I kept mine pretty simple though to let the exquisite silk and lace really shine. The pattern calls for functional buttons, but the ones I added - cute little heart-shaped ones - are purely decorative as I can actually slip this on and off without the need for any closures. Bonus! 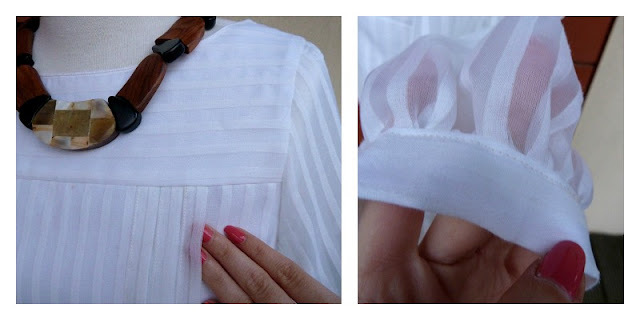 This blouse is full of unique details, which make it a true pleasure to construct. 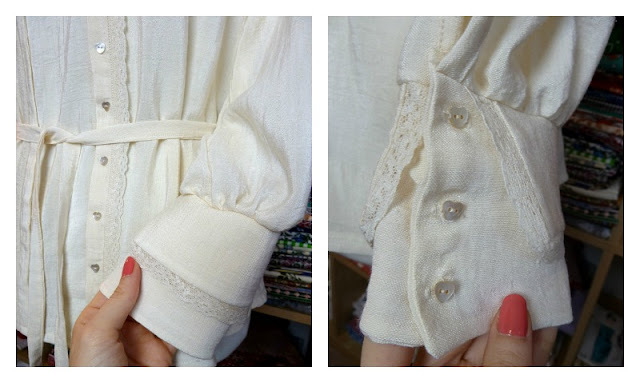 Just look at these elaborate double cuffs with the added lace and tiny buttons...they make my heart melt! This was my first attempt at cuffs with a placket and button holes, but the clear instructions made it an absolute breeze. Initially I was going to be lazy and simplify the cuffs, but I'm so glad I made them in all their glory. 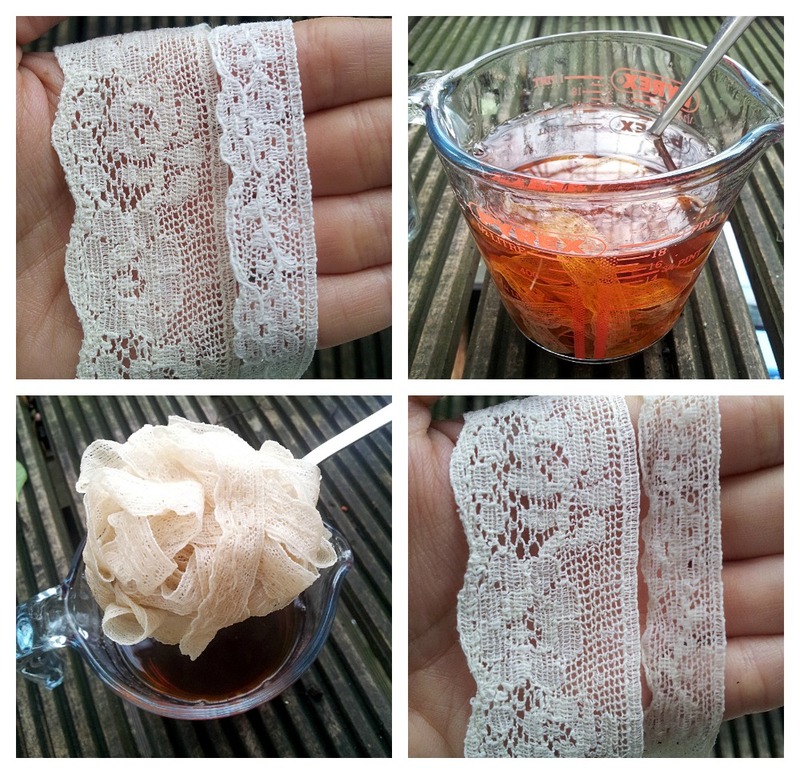 How did I match the lace to the silk so perfectly? I know you're wondering about this, don't pretend you're not impressed! Good old English Breakfast Tea is the answer! You can see below the wider lace I used across the top of the front panel was already the perfect off-white colour, whereas the lace I used to trim the collar, panel and cuffs was much whiter. So I simply dunked a tea bag in hot water, topped the jug up with cold water and literally submerged my lace and quickly spooned it out. And ta da...it came out exactly the same shade as the wider lace! For my purpose the key was not to overdo it, but obviously for a darker stain you just need to brew the teabag stronger and leave your lace in longer. If in doubt, try it out on shorter lengths until you achieve the shade you're after. About the pattern. As I said before, it really was wonderful to work with. I know my decision to work on this slowly and really appreciate the clever construction and elaborate details helped. But the instructions are so clear and easy to follow and I love that the pattern is printed on heavier paper - it's much less flimsy than the traditional tissue paper used and consequently easier to work with. I think the other reason this pattern probably gets the thumbs up from me is that I only needed to make minimal changes to achieve the fit I wanted - I moved the waist gathers and tie up by 3 inches, I added 2 inches to the length and shortened the sleeves by whopping 5.5 inches. So to say I'm really proud of this make and a little smug is an understatement, but my face hides nothing! 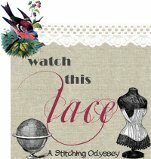 Now I'm all pumped up to feature the next eight Watch This Lace participants...I can't wait to see what they've made! I sure hope you're looking forward to it too!